Cardiovascular diseases are still responsible of the 44% of deaths and represents the first cause of death in the western world. Not all those deaths are caused by common risk factors such as smoking habits, diabetes, hypertension, high cholesterol rates, obesity etc. It has been demonstrated that the genetic predisposition has a critical role in these diseases. Recent studies have allowed for the first time the identification of crucial genetic markers that can significantly can significantly improve the chances of predicting the risk of Acute Myocardial Infarction in addition to the classic Risk Factors. MI Risk test is very easy to perform, fast and non-invasive. It consists of a small swab that the customer can use to collect a saliva sample, simply passing it on his own mouth. Our experts will then extract the DNA from the saliva sample provided by the customer. MI Risk test is “once and for all”, and it is valid for the entire life of a person. By analysing the DNA, it is possible to predict the chances of incurring in a cardiovascular event. The knowledge of the personal genetic risk level will be the basis of everyday life choices that will allow the patient to remain healthy over the years. Analysing the level of Cholesterol in the blood alone is not enough to predict the likely incidence of the patient in a cardiovascular problem. Everyone has a specific genetic asset, which is unique and not modifiable, that render him/her liable to get cardiovascular diseases. 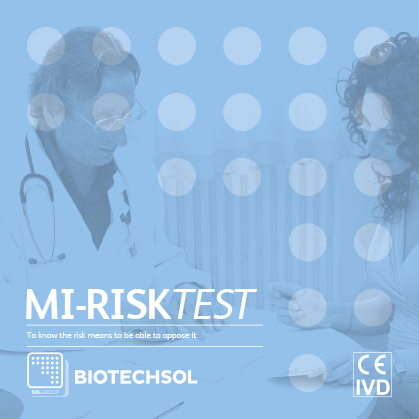 The MI RISK kit can quantify this “basic genetic risk”, collecting predisposition genetic markers with individual information regarding traditional risk factors, for the diagnosis of cardiovascular problems. Once the test is performed, the risk of acute Myocardial Infarct is accurately calculated using an algorithm that combines genetic variations (SNPs) and traditional risk factors. A doctor evaluates the calculated risk and adjusts the medical report on the individual case, suggesting specific medical analysis (ECG, etc. ), the evaluation of drug preventive regimens, or specific behavior changes in order to lower the risk.